‘At Sierra Nevada we take hops seriously’. That they do. Sierra Nevada remains at the pointy end of North American beer production, the beers mainstream, but still as seriously made as ever. In an Australian context, you could probably compare Sierra Nevada to Little Creatures, although Sierra Nevada have 20 years head-start. 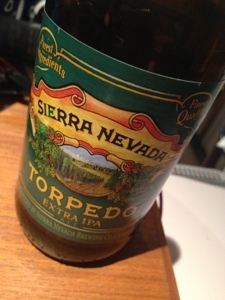 I personally first tasted a Sierra Nevada on a visit to San Francisco a decade ago. I had another reminder back in 2010 when I was last in San Fran and pined for more local supplies. Thankfully the beer gods heard me (I think Ninkasi will do) and much of the range – including some of the special releases – can now be easily found in Australia, which makes me very very happy. This Extra IPA is dry hopped and super powerful, a big, thumping bitter brew that almost falls into astringency thanks to those resinous hops. It’s perhaps a little uncompromising to really love but if you’re looking for impact this is impressive (and quite long). A single beer only proposition but not without enjoyment. Would I buy it again? Only if the Pale Ale wasn’t available. Still enjoyable. Andrew, I've tried a whole raft of these Sierra Nevada beers ("raft" seems the appropriate collective noun since the taste very much of pine resin), but, for sheer balance and drinkability, I think it's difficult to beat the Pale Ale. Some of the Northern/Southern Hemisphere hop vintage stuff, for example, is just a bit too super aggressive for me – and with keen alcohol, with sweetness not going so well together with those resiny hops. Bigger and bolder need not be better with beer once you've got the basic product to a certain level of complexity. That said, I'm not sure the Pale Ale is quite as compelling as it once was. I'm sure it had a bit more of a Malteaser thing (obviously biscuity malt) in days past. I don't think I've been drinking it for long enough to taste obvious changes over the years but you could be right. I'm absolutely with you on the basic Pale Ale being the winner – easily the best balanced of the lot. Simplicity is the winner for sure. No, I haven't. I wasn't much of a fan in the first place. Okay, I suppose. If MSB are doing it now, that's not exactly good news either. Yes, they do some serviceable stuff, but I'd generally rather have a genuine English ale or proper Czech lager slash pilsener. As a general impression, more balance getting into Australian microbrews of late, and less emphasis on aping OTT American styles. Good news. For some cheaper English ales, try the Hook Norton's from Dan's (they have three). About $5 each. Nice gear. Probably the Twelve Days my pick of them. The Haymaker (I think it's called that) next. A pale ale that's not hust about hops. Thanks Michael. Will pop in and get some.